Chiefs Football tradition of partnering with C4K, collecting cleats for athletes in need continues! Please go through your closets and equipment bags and see what cleats (any sport) you may no longer need, that another athlete could benefit from. Bin will be at the Concessions Trailer EVERY PRACTICE! The history of the Cleats4Kids Organization begins back in 2006. As a junior at Cherokee, playing football and having gone through the Marlton Rec program in both football and wrestling, I had been thinking about ways to help out the communities in our surrounding area. Since my father and I both have a heavy background in athletics, football in particular, we knew we wanted to help others in the athletic area. So, after looking around our own house for ideas, we stumbled upon our own personal cleat collection that had accumulated along the years in our garage. For years, we had been visiting my dad's old neighborhood, Frankford, in Philadelphia and donated my old cleats to their youth athletics program for them to distribute to families that could not afford to buy their own cleats. We knew there was a way that we could amplify the results of our personal donation and we set out upon creating our own collection drive, Cleats4Kids, and reached out to the local youth athletic program and high school (Marlton Rec Council and Cherokee High School). By the end of our first collection, we had collected over 100 pairs of cleats and various sporting equipment from very gracious and willing families in the area. Since then, our organization has grown and has been featured in community and regional newspapers and we have continually received more and more pairs of cleats each summer. After we receive cleats, my father and I visit athletic programs in Camden, NJ and Philadelphia, PA and hand over the boxes to their athletic directors that we have contacted. The gratitude these teams show to us when we deliver the cleats is what keeps us motivated to continue organizing and collecting cleats throughout these past several years. We now ask for YOUR help! If you have anything you would like to donate, we will accept it. In the past, we've collected and distributed soccer, baseball, and track cleats to appropriate programs as well as athletic padding and equipment to these underprivileged programs. 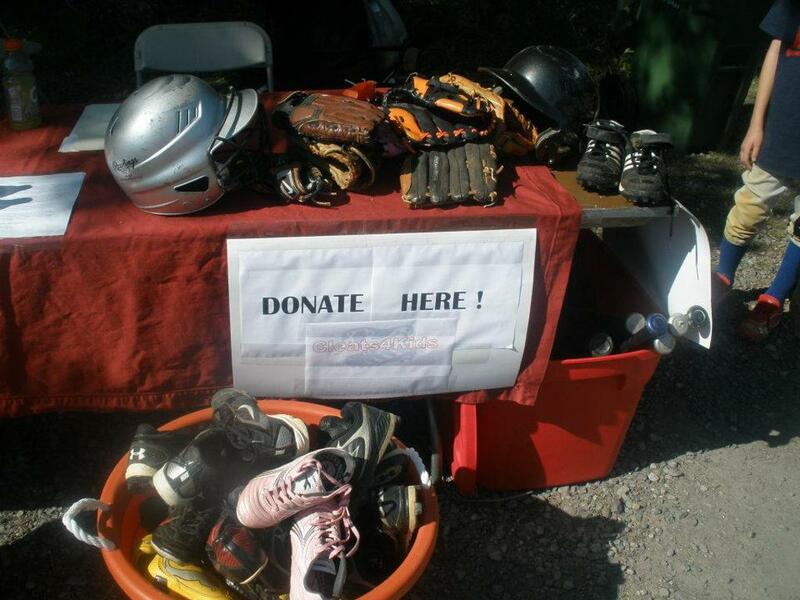 Please be generous and dig through your garage for old cleats and sporting equipment, because it might be your JUNK, but it most definitely could be considered someone else's TREASURE. Thank you!